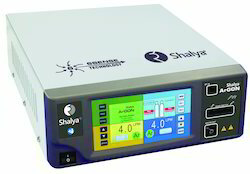 Our product range includes a wide range of shalya argon plasma coagulation, argon plasma coagulator for bronchoscopy surgery, argon plasma coagulator with endo cut, argon plasma coagulator for ercp, argon plasma coagulator for cancer surgery and apc unit shalya apc. No smoke, odour during surgery. Applications : Gastroscopy, Colonoscopy, Bronchoscopy, Laproscopic Surgery, Open & General Surgical Application, oncosurgery. Facility to detect over Pressure in abdomen & give alarm in such a condition. Internal Gas leakage detection of Argon Gas. The Product is also known as Argon Plasma Coagulator for ERCP, Argon Plasma Coagulator for GI Surgery, Argon Plasma Coagulator with Endo Cut, Argon Plasma Coagulator for Cancer Surgery, Argon Plasma Coagulator for Bronchoscopy Surgery, Argon Beam Coagulator for ERCP, Argon Beam Coagulator for GI Surgery, Argon Beam Coagulator with Endo Cut, Argon Beam Coagulator for Cancer Surgery. Argon Beam Coagulator for Bronchoscopy Surgery.